Booking individual seats in any amount under 16 seats will make the cruise open to the public. Public tours are 21 and over but we do allow children 5 years and older to ride on any PRIVATE, FULL BOAT booking. Booking the entire boat means this is your own personal tour for up to 16 passengers. 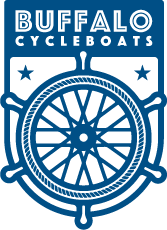 At Buffalo CycleBoats, all cruises are 2 hours, bring your own food and beverages (beer & wine), and music! Captain and first-mate are provided your your safety and enjoyment.